I read Anne of Green Gables for the first time when I was 11. I was the same age as the titular heroine, and I identified with her quite a bit: imaginative, stubborn, temperamental, with a tendency to use a lot of big words. In fact, it’s fair to say that Anne is probably the main reason I have red hair today. So when Anne met her nemesis, Gilbert Blythe and broke a slate over his head, I hated him too. And when Anne—finally!—fell in love with him, I fell in love with him, too. It was probably a year or so after I first read the book that I watched the Kevin Sullivan film adaptations. I never liked the liberties Sullivan took with the books, and I never felt like Megan Follows was my Anne. (Probably because, not so deep down, I wanted to be Anne.) But Jonathan Crombie…Jonathan Crombie was always my Gilbert. Those curls, those twinkly eyes, that chivalrous streak that never went away, even in the face of Anne’s disdain…if ever there was an actor who, in my mind, so perfectly captured the character he played, it was him. And so, when I heard Jonathan Crombie had died, it felt like a small part of my childhood had died. It felt like Gilbert had died, even though I know Gilbert was a fictional character who, if he had lived at all, would have passed decades ago. Jonathan Crombie-as-Gilbert Blythe was one of my first character-crushes, the embodiment of the kind of guy I would daydream about as a 12-year-old girl. And let’s just face it: Gilbert Blythe is the kind of guy you should dream about as an adult. Someone who would do anything for you. Someone who loves you despite your faults, or maybe because of them. Someone who can make you smile even when you’re angry. Someone you love as much as he loves you. I knew it at 12, but somehow I forgot it for a long time as an adult: everyone deserves their Gilbert. I’ve found my Gilbert, and he’s all those things and more. 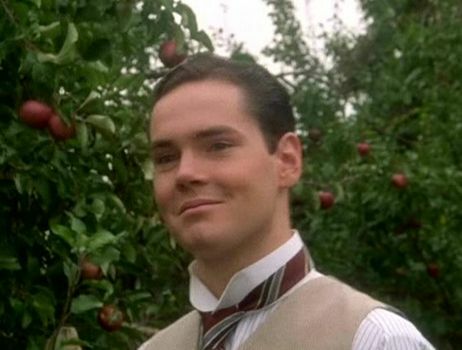 Still, I can’t help but mourn a little for Jonathan Crombie, the man-who-would-be-Gilbert. We’ve got DVDs, online streaming, those never-ending pledge drives on PBS. Still, the world feels like a little bit less without my first Gilbert Blythe.